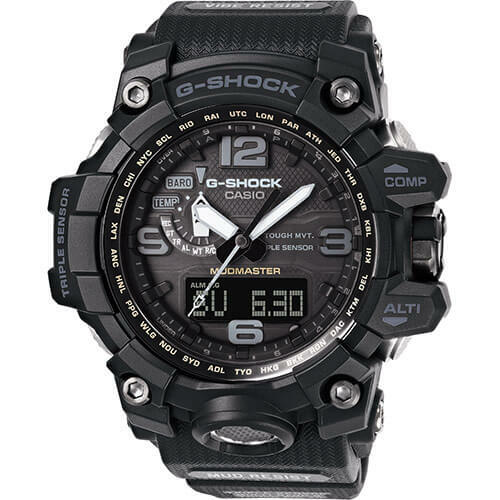 Newly listed by G-Shock Europe, the G-Shock Mudmaster GWG-1000-1A1ER is a nearly blacked out version of the popular Triple Sensor analog-digital model. Similar to the recent Gravitymaster GA-1100-1A1, the GWG-1000-1A1 does have faint bezel lettering paint as well as silver buttons. So perhaps it shouldn’t be considered a black-out model, but it is the most blacked out of any GWG-1000 model so far. The display consists of shades of gray and white, giving it a mostly monochrome appearance except for some light yellow (or maybe beige) coloring for the Mudmaster logo and city codes on the bezel. The GWG-1000-1A1 features Tough Solar power, Multi-Band 6 radio time-syncing, and the Triple Sensor (altimeter/barometer, compass, thermometer), making it one of the more advanced and versatile G-Shock watches available. Other features included a protected button structure with mud and dust resistance, as well as vibration resistance. The GWG-1000 series is one of the most popular analog-digital models in the professional Master of G lineup, and is considered by many to be one of the toughest G-Shock watches. Those who like the look of the GWG-1000-1A1 but would prefer a more affordable model without sensors should look into the solar-powered GWG-100-1A or GSG-100-1A which are also part of the Mudmaster family. Several European online retailers have the GWG-1000-1A1ER listed for sale. We expect to see a wider release for the GWG-1000-1A1 so stay tuned for more details. Update: Casio announced the GWG-1000-1A1 for an April 2018 release in Asia. The GWG1000-1A1 was also released in late April in North America. 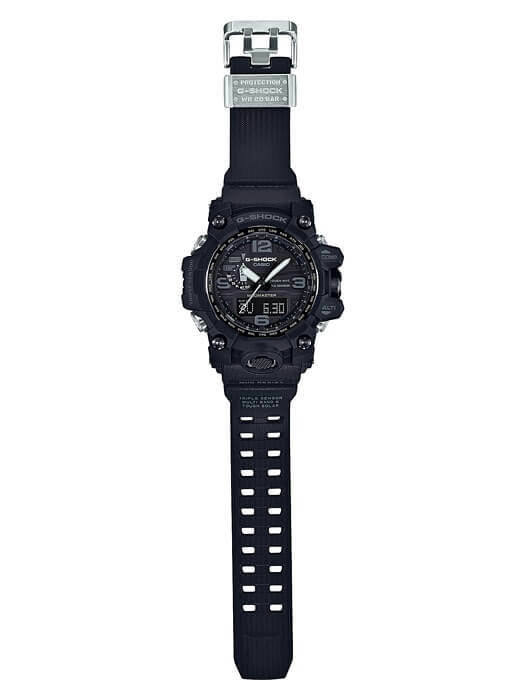 Can you get the Casio G-Shock Mudmaster GWG-1000 series with a positive display? No, all models only have a reverse LCD display so far. There is currently no Mudmaster model with Tough Solar and sensors with no Multi-Band 6. GG-1000 has Twin Sensor (compass and thermometer) but not Tough Solar. GSG-100 has Tough Solar without Multi-Band 6 but no sensors. Quick question. Do the numbers on the GWG1000 1A1 iluminate like the hands?